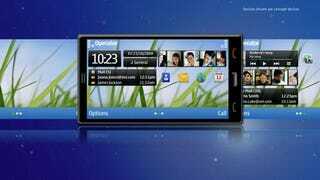 We were surprised yesterday to hear that Nokia is moving ahead with both Symbian and Maemo phones, but reassured by their admission that the Symbian UI kinda blows. Well, now we have juicy screenshots of improvements they've got in mind. Beyond reduced clutter, Nokia also plans to improve input methods (including multi-touch and single tap controls). "Two taps to get to music and video instead of 8, and email access in two steps instead of four….There will also be a significantly improved browser experience." "The interface will be over three times faster than our current high-end devices in many areas…Scrolling will move up to over 60fps compared to 15fps on our current high-end devices."